Celebrating the life of James H. Hogg, Jr.
Obituary for James H. Hogg, Jr.
James Harold Hogg Jr., 60, of Trenton, died Sunday, October 14, 2018, at Ohio's Hospice of Butler & Warren Counties. He was born in Middletown, Ohio on January 30, 1958 to parents James and Betty Jo (Sauter) Hogg Sr.
James had worked in maintenance at AK Steel for 30 years. He was a member of Holy Name of Jesus Church and Knights of Columbus Council #1610. 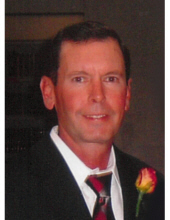 James was an avid sports fan, especially of the Bengals and Ohio State, and had coached baseball, soccer & football. He enjoyed being outdoors, fishing, camping and riding dirt bikes and motorcycles. Mr. Hogg Jr. is survived by his wife, Joy (Combs) Hogg; children, Bryan (Courtney) Hogg, Shaun Hogg & James Nicholas Hogg; one grandchild, Henry James Hogg; parents, James & Betty Hogg; siblings, Patty (John) Stahl, William Scott Hogg, Kathy (Jamie) Steele & Jennifer (Greg) Finke; aunts, Marie Moore & Judy Smallwood; as well as many loving nieces, nephews, cousins & dear friends. He was preceded in death by his grandparents, Herman & Olive Hogg and Carl & Martha Sauter; great nephew, Adam Breedlove; and many aunts & uncles. Mass of Christian Burial will be held Thursday, October 18, 2018 at 10:00 am at Holy Name of Jesus Catholic Church, 222 Hamilton Ave., Trenton. Visitation will be Wednesday from 5:00 - 8:00 pm at Wilson-Schramm-Spaulding Funeral Home, 3805 Roosevelt Blvd., Middletown. Private interment will be at the convenience of the family. Memorial donations may be made to American Cancer Society, 2808 Reading Rd., Cincinnati, OH 45206 – OR - Ohio's Hospice of Dayton, 324 Wilmington Ave., Dayton, OH 45420-1885. To send flowers or a remembrance gift to the family of James H. Hogg, Jr., please visit our Tribute Store. "Email Address" would like to share the life celebration of James H. Hogg, Jr.. Click on the "link" to go to share a favorite memory or leave a condolence message for the family.